Chad’s presence in the Bucks lineup made Yankton a must-visit destination for the country’s most high-profile college basketball coaches. After being courted by more than 100 schools, the 6-foot-11 center chose the University of Minnesota where he would play for Bill Musselman. Before leaving Yankton for Big Ten Conference competition, Chad’s versatility made a lasting impression on South Dakota sports. In addition to his stellar basketball accomplishments, Chad was a standout football player for the Bucks and a state champion in the discus and shot put. 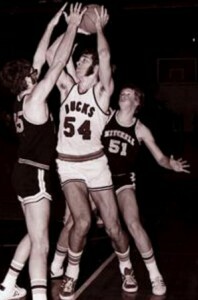 He was named South Dakota High School Athlete of the Year in 1973. In an era when the Parade All-America team was the equivalent of today’s McDonald’s All-America team, Chad was chosen by Parade as one of the country’s top 40 prep basketball players in 1974. Chad was named to the Class A all-state team four years. He was first team all-state his final three seasons and led the Bucks to the state championship game in 1972, 1973 and 1974. Yankton defeated Rapid City Central 70-51 in the finals during Chad’s senior season behind his 24 points and 20 rebounds. The Bucks finished 23-1 that year under Bob Winter with Chad averaging 21 points and 17 rebounds a game. After concluding his Yankton career with 1,668 points, Chad made an immediate impact with the Golden Gophers. As a freshman he played a significant role, including starting several games, to help Minnesota go 18-8. Chad then transferred to Drake University and became an all-Missouri Valley Conference player for Bob Ortegel and the Bulldogs. Because of the transfer rule, Chad initially became eligible for the NBA draft after his junior season at Drake. He was selected by the Jazz in the 1978 draft and by the Hawks in 1979. Chad played professionally four seasons in Israel. Chad is a construction general contractor and lives with his wife Patricia in Edgartown, Mass. They have two daughters, Katherine and Elizabeth. The South Dakota High School Basketball Hall of Fame is proud to induct Chad as a member of its Class of 2013. I am proud to say Chad Nelson is my basketball coach and a amazing role model and I don’t know what the Lady Egals would be like without him.